This was actually my first prop I acquired and what started me collecting. 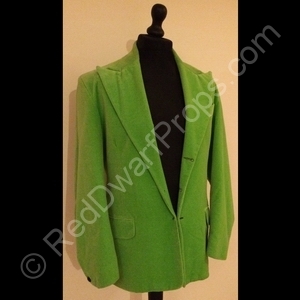 Cats jacket is bright luminous green, made of soft velvet, with no buttons on the front, just an ornate black button on each cuff. Considering it’s age it’s in immaculate condition, and has clearly been stored well since it’s use. Cats Jacket appears on screen in the opening sequence where he is seen piloting Starbug, and then later when they are exploring the ice planet and discover the frozen body of Caroline Carmen. 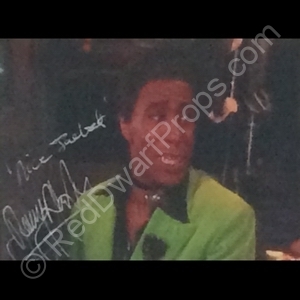 I have an accompanying photo still from the opening scene, signed by Danny John-Jules. 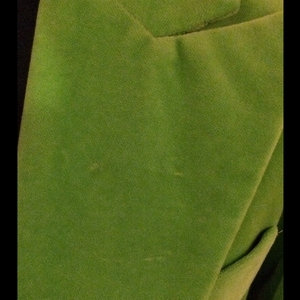 Above his signature is written “Nice Jacket“. I love that, I can almost hear the Cat saying those words. 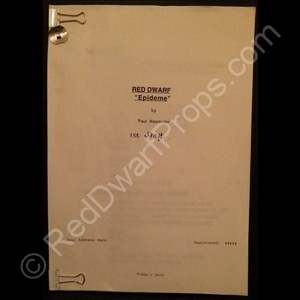 I also have an original matching Epideme script written by Paul Alexander. Tagged 1997, Cat, Danny John-Jules, Epideme, Script, Series VII. Bookmark the permalink.